Station Codes for Railway Stations??? Quote Reply Topic: Station Codes for Railway Stations??? To be posted at arrival at BMG Station. This puzzles me a bit. Can it be that Railways stations also had a 3 letter coder??? If so, what stations are meant by BMG and KHR and have other stations also codes? The image shows the front of the cover plus a part of the back of the cover. Finally i am able to decipher the stations codes. 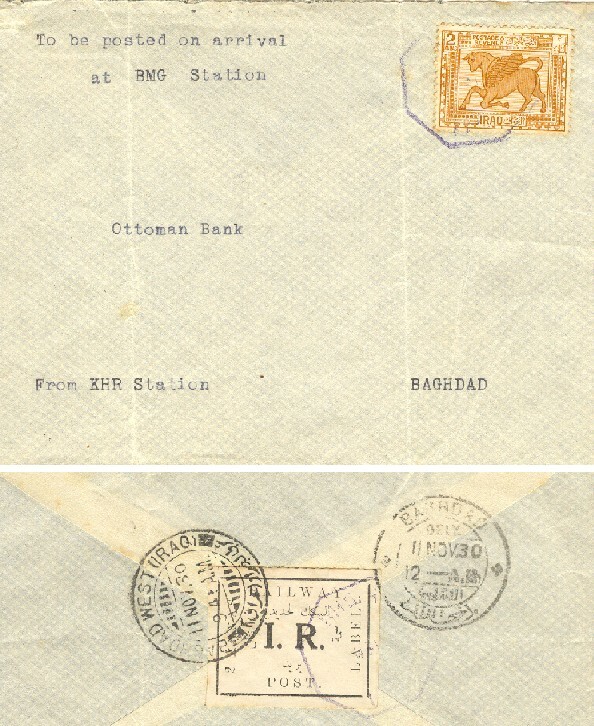 This cover was posted from KHR as it says on it which is almost certain Khanaqin Railway Station. It states that it should be posted on arrival at BMG which stands for Baghdad West (M.G.) M.G. refers to Metric Gauge, hence Baghdad Metric Gauge. There should be another code BSG for Baghdad West (S.G.) whereas S.G. refers to Standard Gauge.